A good question for any organization to determine who are their competitors. A key goal in marketing is to differentiate the firm’s offerings in the marketplace and to offer better or unique value to the target market. However, the identification of competitive sets is probably an area that is probably not addressed adequately when developing marketing strategy. This occurs primarily because most firms simply identify their direct competitors as their only true source of competition. But this is a very narrow view of the overall market and is quite unsuitable for the development of a professional marketing strategy and plan. In reality, the firm’s competitive set should be based on the consumer needs and not just on similar product offerings. As an example, let’s use Coca-Cola. As we all know, their main direct competitor is PepsiCo, because they sell a similar cola beverage. 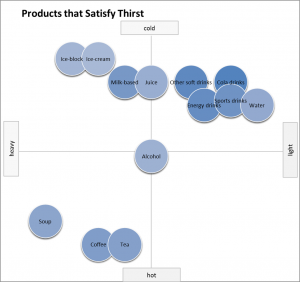 For this example however, let’s concentrate on the main underlying consumer need which is most likely thirst. There are many, many products in the market that can fulfill this need. Obviously we have the whole range of soft drinks, as well as juices, water, energy drinks, sports drinks, milk-based drinks, and even alcohol. If we keep extending this idea, we can see that hot drinks like coffee and tea will meet this consumer need. And there would even be some food items, such as ice-blocks and ice-creams, and potentially even soup that will also satisfy a consumer’s thirst. Therefore, it should be clear that a brand can have a very broad range of competitors, which leads us to the concept of competitive sets. A competitive set is how the firm sees and classifies their broad range of competitors. This first perceptual map highlights the range of competitors that could exist for a consumer simply looking to satisfy their need of thirst. 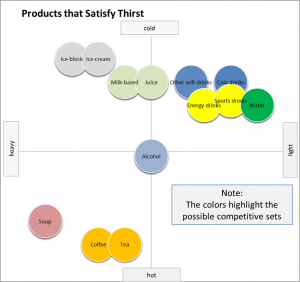 As you see on this perceptual map, there is a very broad range of competitors to consider. Essentially in this case we are looking at the market at a product category level and we are less concerned with brands and individual product offerings at this stage. The main benefit of this style of perceptual map is that it provides a good overall understanding of all potential competitors for a firm. We can also color-code this map and place these competitors into related sets of players (as shown in the following perceptual map). This allows us to simplify the market to some extent so that we can better develop suitable marketing strategies to differentiate and adapt to changing competitive offerings. We can then continue to drill down. A good way to think about this process is like we are looking through a microscope and are increasing the magnification and are looking closer and closer at the market. For our next view of the market and the related consumer need of thirst, let’s limit our view to just cold beverages. As a consequence, we will need to consider different and more relevant product attributes. For this example, we have used high/low energy and whether the taste can be fruity or not. We can then continue to process of examining different competitive levels of a market. 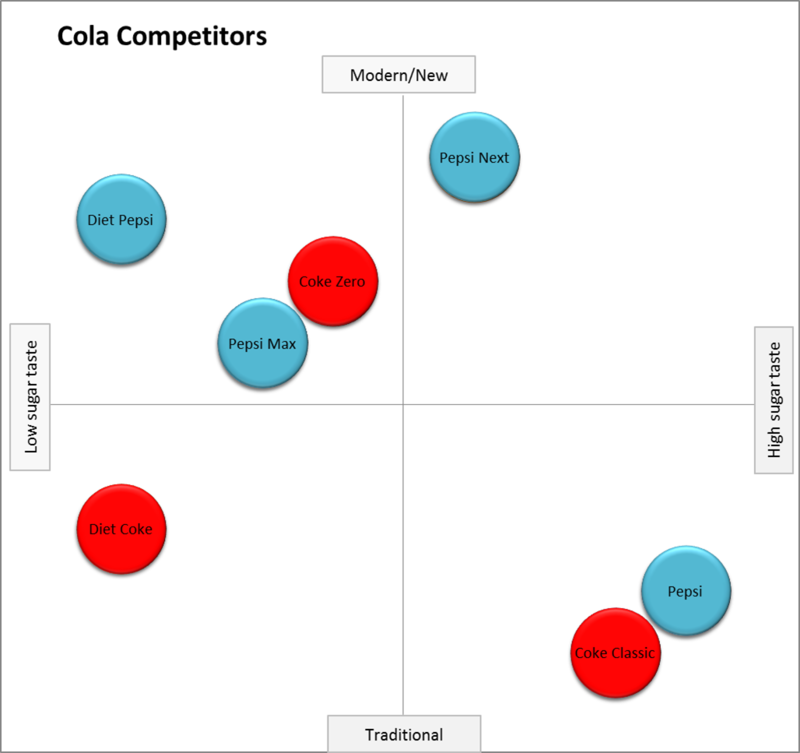 We could have a perceptual map that just shows soft drinks (as shown here) and we can even have a perceptual map that just looks at different brands of cola, as highlighted below. 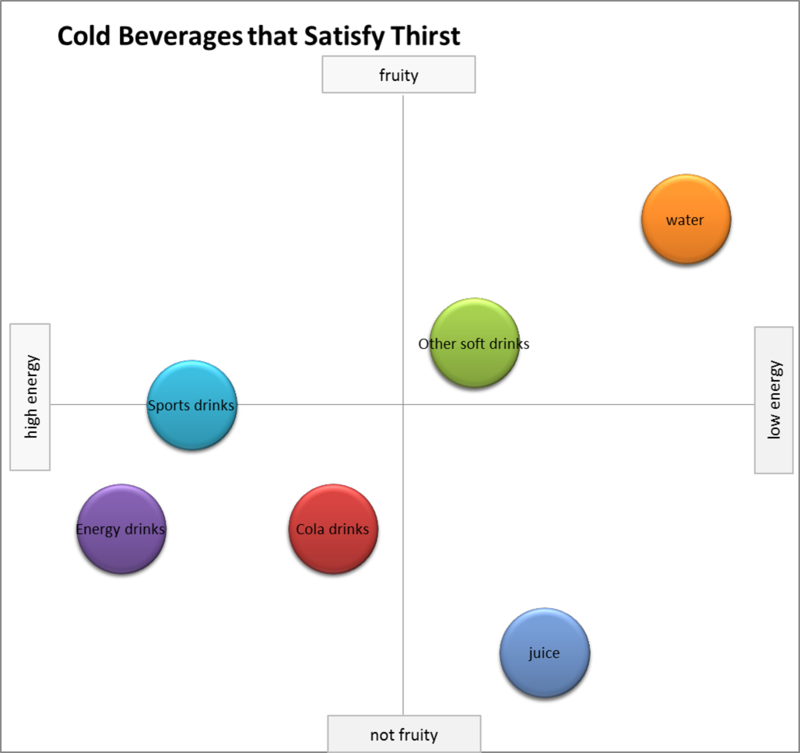 Again, note how the attribute labels of the perceptual map are modified, this time to high/low sugar taste and modern/traditional. 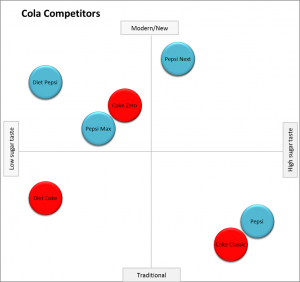 The brands of the two competitors (Coke and Pepsi) have been color-coded as well.